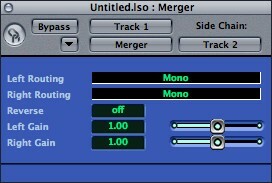 Merger is a utility plug-in that combines two audio channels into one. This is typically useful for e.g. vocoder plug-ins that expect their two inputs on either side of a stereo pair. It doesn't work in Logic 6, presumably because of that host's Audio Unit implementation's limitations. Read Merger news articles on the Expert Sleepers blog.